In what is proof that good ideas are never abandoned, just temporarily sidelined, recent NASA budget cuts have forced the company to, once again, turn to nontraditional means in which to continue space exploration. When first proposed in the 1960’s, inflatable spacecraft seemed like a great idea. 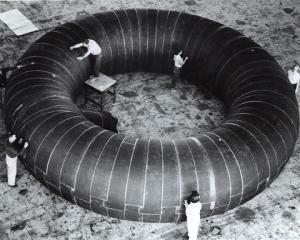 Goodyear developed a prototype rubber space station (seen at your right) which was designed to go into orbit via missile, then inflate to full size. You get a space station in orbit without the cost of sending up big hunks of metal. NASA worked on this idea for about 30 years, then decided to sell the patents to private contractors Bigelow Aerospace. Now, hat in hand, NASA is turning to Bigelow for next-generation inflatable space station modules. Thanks in no small part to cuts in NASA’s budget, they’re looking to maximize their payloads and minize their dollars. It goes without saying that sending up a few rubber (actually Vectran, a double-strength Kevlar material) balloons and oxygen tanks is a whole lot cheaper than flying a giant metal room into space. While radiation shielding and temperature controls still need to be tested, the Vectran used to make Bigelow’s previous test models, Genesis I and II, is actually stronger than the current International Space Station‘s building materials. The next prototype space module, Sundancer, is currently being built.